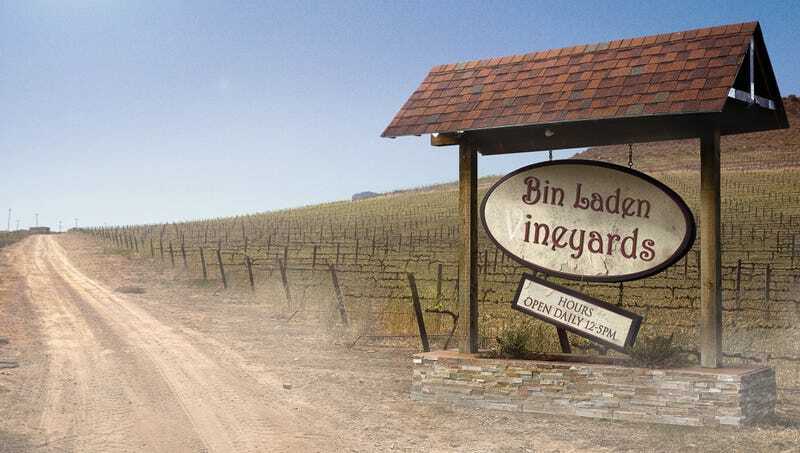 NAPA, CA—After being lovingly tended by generations of bin Ladens, the once-gorgeous Northern California vineyard upon which the late al-Qaeda founder Osama bin Laden’s family winery sits is now crumbling and covered with weeds, sources confirmed Friday. “Bin Laden Manor produced some of the finest wines Napa Valley has ever tasted, so of course it’s a shame to see such an astounding institution wither away due to our neighbor Osama’s passing,” said resident Harriet LaHood of the now-overgrown 72-acre Napa fixture, known for its full-bodied wines and lively polo matches since its 1894 founding by the Saudi-born terrorist’s grandfather Awad bin Laden. “It’s such a tragedy because for decades, the name ‘bin Laden’ was practically synonymous with the award-winning cabernet and chardonnay varietals that made the Valley famous. Osama began learning how to tend the grapes when he was just 3 years old, with his father hoping that one day the boy would become a legendary vinter in his own right. Unfortunately, that legacy came to an end not long after the bin Ladens won the Wine Spectator Readers’ Choice Award for best merlot back in ’09.” At press time, neighbors confirmed they had renewed hopes for the vineyard after spotting Osama’s son Hamza bin Laden scouting the property with a substantial entourage of men carrying Kalashnikovs.